From the day that powered transport was invented people have raced. They’ve raced against time and they’ve raced against one another. Britain is a real petrolhead nation and so it’s no surprise to find literally hundreds of motor clubs of various description dotted all over the country. There are racetracks like Brands Hatch, rally schools, hill climbs, motocross tracks, in fact Britain has it all - even a banked oval in the shape of Rockingham Motor Speedway. It doesn’t matter if you are a long term vintage car racing enthusiast or you just fancy trying a ride on a mini-moto there’s likely to be a facility nearby ready to serve your need for speed. 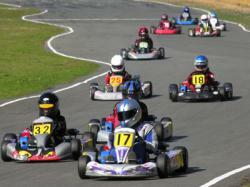 If you fancy racing then first you need to decide what you’ll race and where. Even deciding how many wheels to race on can be a hard choice because you can go racing on two, three, four and even six wheels - if you fancy a bash at truck racing! Some people race on closed roads or race tracks, others prefer to do it in the dirt, or even on the beach in the case of beach racing. Regardless of the type of racing you choose be sure to look through the listings for a properly accredited club. Motor sport is by nature a dangerous pastime so make sure you are always properly equipped and supervised.